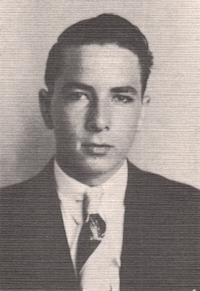 Obituary – Wiehe, Benjamin August « Perry High School Alumni Association, Inc.
Football ’45-46; Perryscope Staff ’45-’46. Benjamin August Wiehe, was born February 18, 1928 in Perry, OK to Ada Hicks and Benjamin A. Wiehe Sr. He passed from this life, Wednesday, February 7, 2001 at the age of 72. He was a graduate of Perry, OK High School, received his Bachelor’s of Science and Master’s degrees in Education Administration from Oklahoma State University (then A&M) and did his doctorate work at the University of Tulsa. Ben was a veteran who rose to the rank of Corporal in the 11th Airborn Division, serving with the WWII Army Occupation Special Forces in Japan. He also served in the 45th Infantry Division of the Oklahoma National Guard during the Korean War. He reverted to state service as Sergeant First class in 1952 at Ft. Benning, GA.
Ben married Charldean Milliron, January 1, 1949. He worked as educator and principal for 31 years. He taught at Roosevelt Junior High School, Webster High School and Patrick Henry Elementary School. He was a principal for 28 years, working at Jefferson, Porter, McBirney, McKinley and Kerr Elementary Schools. Ben was a member of First United Methodist Church; past President of Tulsa Southwest Rotary Club; member of the Association of Elementary School Principals for both Tulsa and Oklahoma; past President Cooperative council for Oklahoma School Administration; Brookside Masonic Lodge; both the Brookside and Martha Daylight Orders of Eastern Star. Ben was preceded in death by his son, Fred Wiehe.